Bear with me, this might get funky. See, the tricky thing about smoothies is that there are infinite possibilities. It can be overwhelming for even the coolest of heads out there. Continuing with (self-proclaimed) Smoothie Week, I figured I’d step up to alleviate at least some of the smoothie stagnation in the world (sorry — once I start alliterating, I’m slow to stop). Print it out, stick it on your fridge, and may it bring you many blenders’ worth of smoothie inspiration. 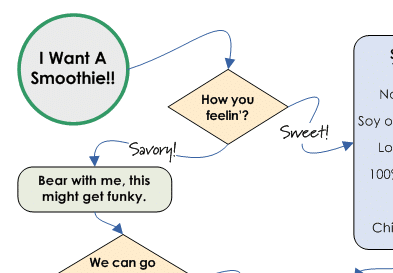 If you’d like to share the smoothie flowchart on your own website or blog, please be respectful (and law-abiding) and share it by linking directly to this post. Please do not link directly to the PDF or copy the PDF to your own server. Thanks! Thanks for this a fun tool for making smoothies, even though it looks complicated, it’s pretty simple. Only thing missing here is adding cacao powder as an option in the “Want more flavor?” answer chart and a bubble asking “Want it sweeter?” after a taste test. wow! you are super awesome! this is great! LOVE it!!! Will plaster this on inside of my cabinet door. What a cool chart with such great information. I often am wondering what will work with my smoothies. could have added the oats for extra fiber. Thanks, Barbara! Your watermelon smoothie sounds delicious. Oh my gosh! … this is awesome.